Phew, this is probably the longest wine name I ever wrote down…who complains about German wine labels when they see this? I like to call the wine simply Briareo. This wine review is right in line with my recent praises of this wonderful community I have found through blogging (see here). Some of you know my constant complaining (and might actually be sick of it by now) about the absurdity that is the U.S. wine pricing system. I still cannot get over how expensive “better” wines are in this country. Blame the stupid three tier system, blame the high prices of French and Italian wines that the market somehow adopted for pretty much anything else, blame whatever you want. I still don’t think it is just the shipping that makes wines so expensive, because containers are not that expensive anymore…but, end of rant. Several months ago, I realized that my wine friend Anatoli over at Talk-a-vino kept mentioning this wine site Wines Till Sold Out (or short WTSO). It is a site that sells one wine at a time, usually at a steep discount. Shipping is free if you buy a couple of bottles (usually between 2-4, depending on the wine). I started eyeing that website and realized that besides the usual suspects of California Cabernet Sauvignons and Burgundy whites, they also sell a lot of Italian reds. And the prices are actually quite good. Given that, including shipping, you usually end up with a price tag of somewhere above 70 bucks for between 2-4 bottles, it is still a considerable amount of money for this Germany spoiled imbiber. So I never bought anything. Then, shortly before Christmas, WTSO was offering this wine, the 2006 Briareo and I simply had to buy it, as in HAD to buy it. I visited that winery (actually it is a cooperative) when I was in Montepulciano in 2005 and I LOVED, LOVED, LOVED their standard Vino Nobile (we took a case back to Germany). Back then, the Briareo didn’t seem to offer much better quality than the standard, and the standard was considerably lower priced (I think 12 euros per bottle instead of the 19 per bottle they wanted to the Briareo). But now, that did not matter: This was a winery I had visited and whose wines I remembered fondly, and that wine was selling for $18!! Incredible. So, I ordered four bottles to fulfill the minimum requirement for shipping. The wines arrived after we returned from our Alaska trip in mid January. And have been sitting in the wine rack since. I have to say, I was actually hesitant to open a bottle. I remembered their wines so fondly, but this was a different vintage etc. etc. etc. What if I was going to be totally disappointed? (I can be a worrier…) Sunday night we decided to open a bottle. The heck, we still have three left after that one! Plus, I left Ann Arbor for a couple of weeks to help out a good friend of mine with some stuff in San Antonio, Texas, so why not make this a good last evening before I left? The wine, as a proper Vino Nobile, is made from a mix of Sangiovese grapes (in Montepulciano that grape is called Prugnolo Gentile and a Vino Nobile needs to have a minimum of 70% of that grape in it) and Canaiolo. While a standard Vino Nobile gets to age two years in oak, a Riserva spends a minimum of three years in oak. The crazy name “Argo et Non Briareo” is actually a reference to a medieval Latin inscription that is in one of the winery’s walls. It translates to “Argus and not Briareus”. Now that is not very helpful, right? Let me help you a bit with Roman and Greek mythology: Argus is a giant with a hundred eyes. (In German, a saying translates to “You have eyes like Argus.”) Briareus, in contrast, is a giant with just one eye. The inscription means it is better to be Argus with a hundred eyes than Briareus with one eye. According to the winery, they picked that inscription for the wine’s name because the wine is also better enjoyed with a hundred eyes because of its depth and sophistication than just one eye. Kind of cute that story. I have actually seen that inscription on the outside of their cellar walls. 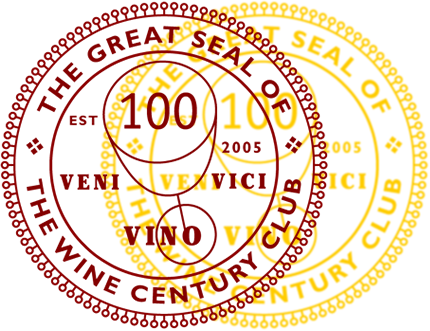 Vecchia Cantina, the cooperative, was founded in 1937 by fourteen winemakers. You can find their website here. But enough, enough of the gibberish. Let’s dive into this wine. I decanted it and oh boy, did this wine need decanting! We followed the wine over the course of 2 1/2 hours and its development was fascinating. It poured in a pale red to garnet color, very light. The initial nose was dominated by cherries, tobacco (lots of it) and floral aromas. After 30 minutes of decanting, the flavor was dominated by acidity and quite an amount of peppery heat which was really weird and disconcerting. I got violets, tobacco, leather and some plums. It was a thin, not very interesting wine. So we decided to let it stand for a bit. And after 90 minutes in the decanter it finally began opening up: The cherry notes became more prominent in the nose, the heat was virtually gone from the wine. It was deep and interesting while at the same time retaining that refreshing lightness. After two hours, the nose got super fruity, with a lingering tobacco aroma and some dark chocolate. It even seemed like the color had changed to a darker red, almost ruby. Now I finally enjoyed the wine. Its finish was long and enticing. I still think it should have had a little more heft to it given that it is a Riserva, but it was really yummy. And the best thing was how much Nina enjoyed it. She LOVED the Briareo and couldn’t get enough of it. Just for those curious: The Wine Spectator rated this wine with 93 points and states its ageing potential as 2012-2025. According to their notes, there is dried cherry and berries, floral aromas, licorice, spices and leather aromas in the nose as well as on the palate. Long finish with ripe fruit and flowers. Now I wish I had bought more bottles, because the price tag ($18) was great and if I want to taste it once a year within the suggested drinking window, I need to get a couple more to make it to 2025…:) Thank you, Anatoli! What was the name of the vineyard you visited? I went to it as well and for the life of me I can’t remember the name of it. Great article. I’ve been using WTSO for a few years and have found some great wines on it (a few Grand Cru Burgandies and CDP’s). I’m opening my first bottle of the 2006 Redi tonight (bought it a couple weeks ago $19.90 on WTSO). I will decant now that I’ve read your experience with this wine. Thank you, Keith, for taking the time to comment! I hope you’re having a good experience with the Redi!! Please come back an let me know what you think. My pleasure, and thank you very much, Oliver, for all the mentions! I’m both happy to see you had great first experience with WTSO and feel bad that I didn’t respond on your post earlier. A very interesting tale and you have hit one of my many weak spots. Monte’s have been one of my go to wines from the first bottle that I tried. I think that they are a hidden gem in the wine world. I try to never pass one up. It sounds like you found a great wine. Enjoy the rest over the years, if you can. I wholeheartedly agree that fond memories associated with a wine make it far more enjoyable. There is just a connector in our brains that turns on. I think it is important to note whether one has a personal connection, memory with a place. It can tilt the impression of the wine. I have never had the Briareo before, but based on your review will be on the lookout for it: sounds like I would like it almost ;-) as much as Nina did!!! You will only fully understand what it means when Nina loves a wine once you have seen her face light up when drinking something she relishes. Usually happens with Riesling. But she is also a fan of Italian reds. 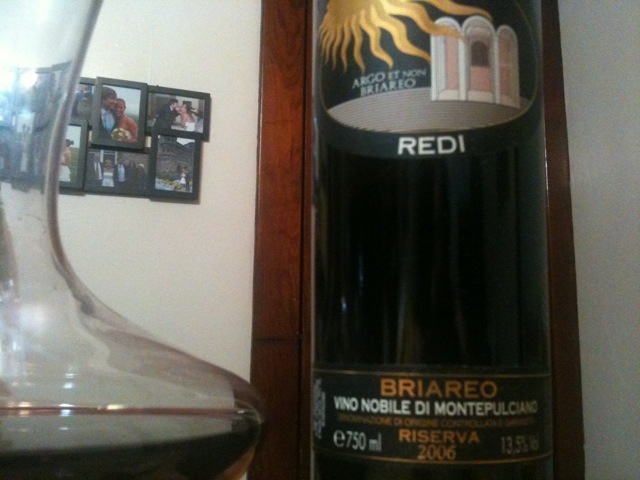 I would love to taste the standard Vino Nobile because, as I said, I remembered it being as good. I’ll be holding on to the other three bottles for a bit longer, so come out and visit! I don’t decant much? But noticed that you do frequently – why? What is your criteria for determining that a wine needs decanting? I like to decant wines so that they open up: usually younger, dark reds (I am not fond of harsh tannins) and older Rieslings (like 12 years plus) to give them some air to develop their aromas. The greater surface exposed to air in a decanter can speed up that opening up process. Given this wine’s drinking window that I saw in the Wine Spectator (2012-2025), I figured it was worth aerating it. And I think it really paid off on this wine. It does help – I may try decanting some wines over the next couple of weeks to see if I can tell a difference. Thanks!!! Yeah, give it a try. The best way to compare might be two bottles of the same wine, decant one for an hour and drink the other straight…then see what you like more. Thanks for sharing the WTSO site! I’m excited to look into it. I love it when I’m surprised by a wine that changes completely from something not so great into something amazing just by sitting for an hour or so. I’ll be on the lookout for this! Argus and not Briareus . . . fun story! And I’m intrigued by this Wines Till Sold Out . . . will have to keep an eye on that site. Especially if they’re scoring quality Italian reds! Thanks for the tip. Prost!! Glad I can help! They will have a flash sale on the 20th, I think, so that should be fun. What fun! I don’t think the background info is boring gibberish–it’s part of what I appreciate about wine (the cultural context its grown in). Interesting–and I’m glad you both enjoyed the wine.